All right, this massive module & bestiary clock in at 214 pages, 1 page front cover, 1 page editorial, 1 page ToC, 1 page SRD, 1 page back cover, leaving us with a whopping219 pages of content, so let’s take a look! Wait, before we dive into the module: If you are only interested in the bestiary section, which takes up 124 pages of the pdf, you should know that it is available as a stand-alone file, as “Fantastical Creatures and How to Survive Them – A Student’s Guide for Adventure & Study.” If you want to know about these creatures and what I think about them, please consult my review of that tome – the combined reviews should provide the information you need for an informed decision. Tier encompasses levels 1-4; tier 2covers levels 5 – 8; tier 3 levels 9 – 12, tier 4 levels 12 – 16 and tier 5 levels 17 – 20. So yeah, you may run this module in a wildly different way, multiple times, if you’re so inclined. It should also be noted, in case you’re not aware of that, that this module makes ample use of the Spheres of Power system. All right, and this is as far as I can go without diving into SPOILER-territory. Potential players should jump to the conclusion. All right, only GMs around? Great! Windfell Academy is situated on the world of Skybourne and can relatively easily be used in any world that has a sufficiently prominent and organized magic tradition – as such, it fits best with high fantasy worlds. But the academy is different from regular schools: One look at the stats for the professors should make clear that this is quite probably THE wizard’s academy of the world. They pretty much almost all clock in at epic CR 20s, with the headmaster transcending even their mighty powers. The academy circles the planet atop a massive, floating island…and it specializes in secondary education, which, yes, means that this place is for the pros. As such student disappearances are not really uncommon – but lately, they have been happening more often…and a month ago, none other than the headmaster has vanished!! The deputy headmaster, the tiny gnome archmage Tocs has vowed to keep the school open…but the headmaster needs to be found…and it is quite likely that the PCs, enrolled as students, will have all of their hands full with the rigorous studying required – here, the module is somewhat reminiscent of Persona, in that tiredness, end of the week tests, classes and adventuring have to be managed by the party. A teacher will be designated ally, one villain, and this constellation influences directly the read-aloud text and respective interaction that the various events that are interspersed throughout the module’s day-to-day-routine. These events also include tests of various types of prowess and may yield information, magical items, etc. The module also allows for the gathering of rumors, provided your time-management skills are up to par, and a small cadre of supporting cast characters, no less colorful than the amazing Profs, makes for a nice help. Speaking of them: Beyond the stat-information provided in the bestiary section, the respective professor entries sport the villain clues…and in e.g. the tier 5 scenarios, they have the Great Ally – a vastly powerful wildcard that makes their threat even more potent. Better yet, the colorful and intriguing Professors, amazing characters one and all, feature valid justifications for being both allies, villains or neutral parties – the module manages to retain its internal logic in all of the characters. Impressive indeed! The academy, just fyi, covers no less than 4 floors and 2 dungeon levels (all featured on player-friendly maps denoting the respective areas – for they ARE the regular spaces of the academy) – and now that the basic set-up of the plotline has been customized, the adventuring can begin…though it should be noted that the surrounding landscape is also properly mapped…and that is not even the primary adventuring locale, for there are levels of secret dungeons under the academy – abandoned, at least seemingly, and teeming with dangerous threats, powerful foes and highly modular challenges. the dungeon-levels are massive, their effects are creative and diverse…and with rooms like vampire kitchens, abomination fighting arenas and the like, are certain to remain with the players long after the module is done. Now here is the truly amazing aspect of the respective modularity: Each of the professors has his/her own lair – a final mini-dungeon, if you will – and these are fully mapped in gorgeous full-color as well – and yes, they are befitting of the respective personality! From caverns with underground rivers to floating castles, mighty workshops and the like, the respective boss lair-mini-dungeons are highly hackable and easy to use as stand-alone, smaller dungeons. Editing and formatting are top-notch, I noticed no serious accumulation of hiccups. Layout adheres to a nice 2-column full-color standard and the pdf comes fully bookmarked for your convenience. The pdf sports solid, sketchbook-like artworks, which in particular make the bestiary section really feel like a field guide – it is an acquired taste, though, and will not sit 100% well with everyone. The cartography in full-color is excellent and now comes with full player-friendly map support! Adam Meyers, with Andrew Stoeckle, Derfael Oliveira, Michael Uhland, Douglas Schaub, John Little and Casey Hayes, has created a massive, extremely modular adventure/ supplement that really surprised me. Why? Because I really, really hate Harry Potter. I am not the biggest fan of the magic school trope. But this one is amazing – it is bonkers, creative and the unique professors and personalities are thoroughly captivating. The schedule and time management issues, the modularity – all of these potentially enhance the value of this book…oh, and as a bonus, it manages to feel a bit like playing a Persona game. 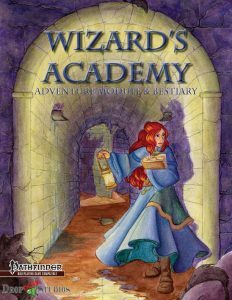 Heck, I bet I could easily craft a whole campaign against the backdrop of this module and its evocative academy – add characters, students, etc. and there you go! Additional dungeons and materials are similarly easily sprinkled in, blending to a degree the boundaries between module and campaign setting. Particularly as a high-level module, when you get to use the cool NPCs and high-level threats, this really shines. In short: This is well worth getting! The colorful NPCs and creative monsters and the modular set-up make this a really interesting offering that has plenty to offer beyond the plotline it features. In short: I really love this. If you’re using Spheres of Power, then this is pretty much a no-brainer-purchase…and even if you don’t, this may be worth it for scavenging-purposes. My final verdict will clock in at 5 stars, and since by now, player-friendly maps have been added, this now also gets my seal of approval. You can get this massive, replayable module here on OBS! You can directly support Drop Dead Studios making more Spheres of Power-books here on patreon!